Michael Myers: The new Halloween movie is coming soon. We shall see if he lives or dies? Lean Rap Artist. Make sure you sharpie your face with plenty of tats! And don’t forget the Styrofoam cup!! Beer Pong Table: A couple had a flat board on their front-side with plastic red cups glued on the board. You could throw ping pong balls at it. Looked like fun. Eminem: You could mix this up with some M&M’s or dye your hair blonde and get a black hoodie and some Nike’s. The Family from Hotel Transylvania 1, 2 or 3. I like this movie series. What are you wearing? What would you add to the list? Let us know in the comments section. Have a nice day and Happy Halloween 2018! Checking Today’s PSNY IG, I came across these pix. It’s another PSNY x Alpha Industries Olive Green Bomber Drop. This time, it comes with a nice WNL (We Need Leaders) patch on the front. The pictures mention that it was released at a Party this past Tuesday (10/24/17). Looks like attendees were treated to some delicious PSNY x MOET & CHANDON champagne. I checked the PSNY website and so far, I see the first PSNY Olive Bomber, but not the new version. Hmmm. Maybe Sunday or Monday it will hit the site. I did hear it may also be at Saks and/or Bloomingdale’s. I like this new version better with the WNL circular patch. What do you think of it? I’ll have the finished version ready by late November 2017 and will post it here or on the Streetzblog Facebook page. BTW: The bomber in black, dark blue or green is on trend again this year and for a bit of a change of pace, check out some of the plaid wool bombers hitting the stores this month and next. Plaid Bombers & Bold Plaid pants are in for Winter 2017 and Spring 2018. Two big weekends of Coachella 2016 have come and gone. It’s the start of the U.S.A’s Festival season and it also kicks off the Summers clothing trends. Past years have brought us lots of Flower Power, Faded Short Denim Shorts, Crocheted Everything, and 1970’s Rock Band Shirts. 2016 brought us many pairs of various Sunglasses, most of which were worn at Night during the EDM shows. The pairs I noticed the most were Aviators with mirrored lenses in various shades of Bright Aqua, Electric Orange, Rushing Red, Vibrant Green and Sun Streaked Yellow. Mostly worn by hip, young good-looking males and females in the front rows. *My friend, Kevin K thinks that they were given away FREE as a guerilla marketing technique. If so, they were very successful and most likely Ray-Bans. If not, it was just the thing to do…Wear your Sunglasses at Night. Most likely a mixture of the 2, because there sure were a lot of Sunglasses worn Night and Day at Coachella 2016! *The Colored Mirrored Aviators are what I noticed as the number 1 trend for Summer 2016. *I know number one is combat boots and Docs, but I would have put them in separate categories. Going with Combat Boots at number 1 and Doc Martins at number 2. Grimes: I’ve never seen her perform before and truly enjoyed the energy, in the moment mixing, the dancing, crazy beats and what I’d call her totally own style of a music genre. Great Show! Zedd on Saturday and Calvin Harris on Sunday with LIVE performances by the actual singers of the tunes during their DJ sets. The lights and pyro of both shows were also awesome and the homage to Daft Punk was excellent. If you’ve ever seen the Daft Punk Documentary, they show how Daft Punk paved the way to the super-star millionaire DJ of today. And the break thru moment happened when they played Coachella. Loved it how they both played Daft Punk’s One More Time. BTW: In 2000, I had a Music TV show called XLR8TV with my Friend Don F and on our last show we played One More Time, One More Time, Then again One More Time, while I introduced it again and again without laughing..for the full half hour of the show. Was so, totally awesome! 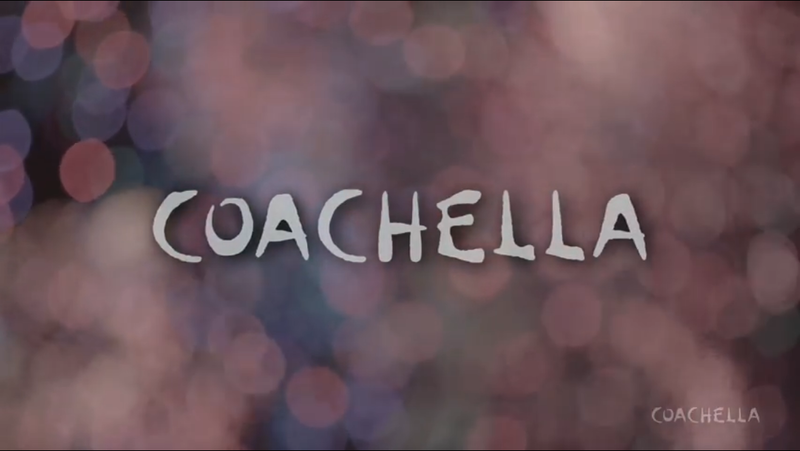 Overall, Coachella was quite good this year; YouTube and T-Mobile did a nice job streaming it live the first weekend. It was very clear on my iPhone, a little glitchy on my MacBook Pro, but overall the best I’ve seen over the years. The only sucky part was the G&R Reunion. 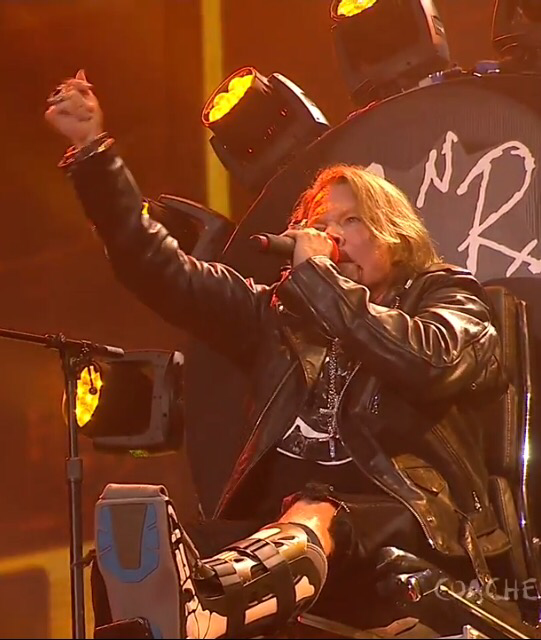 Axl looked really funny on his throne and as far as I could tell they played only 3 songs on YouTube, then 1 song on someones Periscope/Twitter feed for a total of 4 songs. That doesn’t seem quite worth the millions of dollars they paid the band. But, I will say they did sound good. Clear, concise and seemed to be quite professional about the whole gig. *All pictures taken with my iPhone 5s via the live streaming Video. See you on the Streetz! This weekend at Sustainable Coastlines Clean-Up, May Day is Lei Day in Hawaii, My B-Day, The Basketball Court and hopefully Yoga and the Beach. Here’s Corey Hart’s: Sunglasses at Night Video. Yep, I couldn’t resist it. Enjoy! I highly doubt anyone will ever beat Red Bull as the Go to default for an Energy Drink. Many have tried, many have tasted better, were packaged better. But, one of the biggest marketing laws ever is “First In” will win continuously or at least for a very long time and Red Bull was First in on the Energy Drink Category. And, Look how long Coca Cola or Coke has lasted in the soda category? 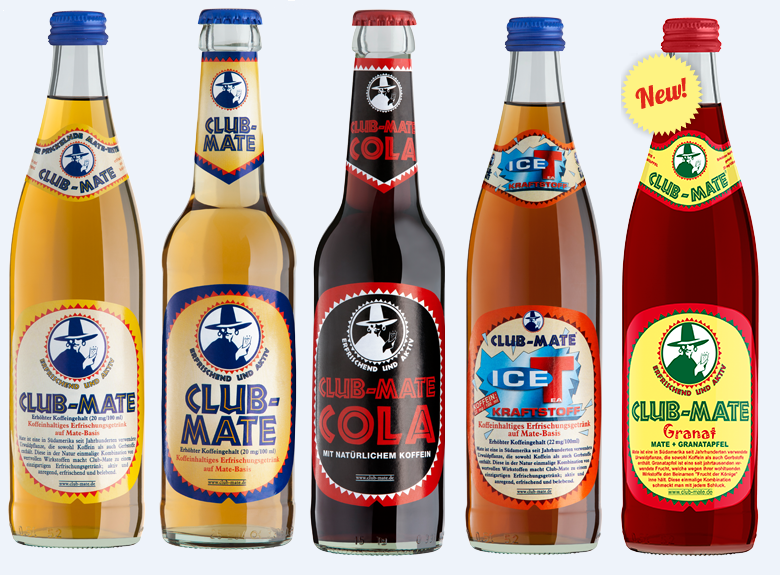 Yet, Club-Mate, a highly caffeinated soda from Germany is buzzing in all the right places to make it pretty massive fairly soon. Berlin computer programmers were amongst the first early adopters in the early Aughts, next it hit the German Rave scene where expectedly it was mixed with Alcohol. Today (August 17, 2015) it’s stocked and ready for action at some of the most famous Hi-Tech companies including: Facebook, Kickstarter, and Gawker. 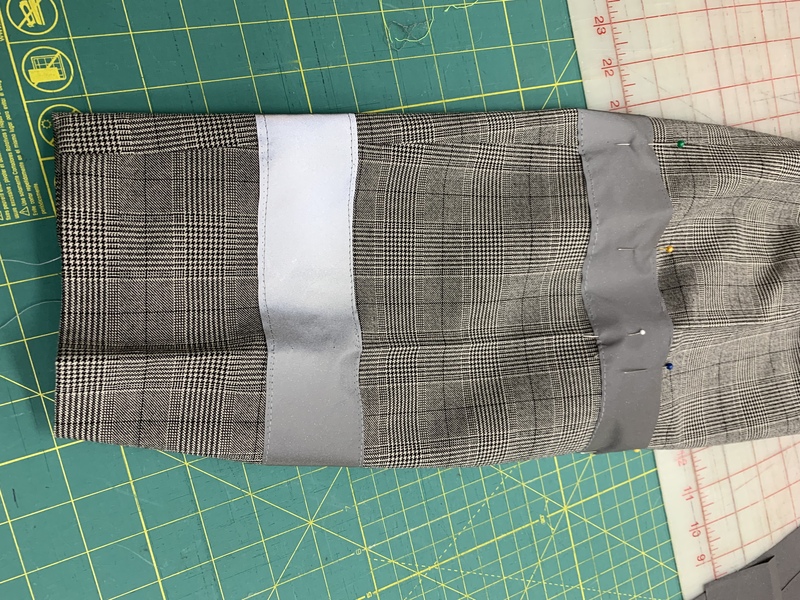 As it moves along the tech-track, it’s also highly visible where trends kick into gear fairly quickly including bodega’s in the Hipster areas of Brooklyn and the Lower East Side of NYC. A little side story, When I was in Berlin in 1996, I drank Red Bull every day. This special Berlin Concoction of the brand name was so potent (At the time 3x more caffeine than the American version eventually contained), I could only drink half a can in 3 hours. I’m 1 of those people that loves to track trends and look for the NBT, I figured this was it and I was finally going to be a millionaire. I brought back 4 cans of the coveted Red Bull, had a few friends over and gave them a couple. They loved the buzz, but didn’t quite like the taste all that much. I still thought it was my ticket to the Big $$’s. But as what used to happen to me, Life Happened and I went to work as I was supposed to and let my RB dream go on the wayside. It was about 2, maybe 3 years before it went big in the states. Maybe, it’s time to get some of this Club-Mate out to Hawaii and make those Mills? Whatcha’ Think? Anyone tasted it? Seen it in their local little store or bodega? We call them little stores in Hawaii. I’ve yet to taste a Club-Mate, but if it comes from Berlin, where I tasted my first Red Bull, this should be pretty Big. LMK if you see it or taste it and what you think of it? Maybe we can all make some Money! See you on the Streetz. This Week, I’ll be checking out Straight Outta’ Compton, a couple local concerts and maybe, hopefully, finally making it to the beach before the Summer is over. Have a nice week!